In the late 80s, early 90s a fantasy book came out that I only read the first part of before I lost it. The premise was intriguing and I have always wanted to return and discover what happened. From what I remember, a guy buys a house and finds a portal to another world in one of the adjoining buildings. When he first goes through the portal he lands on a beach and discovers a shipwreck with gold coins. He gathers some up, sells them on Earth and prepares himself to explore this new world. Marion Zimmer Bradley is one possibility "The House between Worlds" It's one of her earlier works; lots of the ideas for Darkover are present in not quite final form. Don't remember much except the portal bit. Clifford Simak has a novelette about aliens who create such a door, "The Big Front Yard" The protaganist, a general handiman, who makes a living buying and selling this and that finds that his house has some kind of pest that drives his dog crazy. He gets up one morning and finds that his front door opens out onto another world. Different time of day, different plants. And then the fun begins. Stairway To Forever by Robert Adams. Life has not been easy for "Fitz" Fitzgilbert. He has survived the battlefield, personal tragedy, and economic hardship; now all he wants is peace. He moves into an isolated, ramshackle house built—oddly—on an earthen mound. Then he uncovers a hidden stone passageway beneath the house—and falls through an invisible doorway into another world! Except for the bizarre beasts that crawl its shoreline, the "sand world" seems deserted. Yet Fitz is not alone. First he is visited by an old friend, who reveals that Fitz has a mission in this strange new world. Then he is supplied with traveling companions: a Norman knight, transported from the 11th century via unexplainable magic; and a 1950s jazz musician trapped in a most unusual new body. Together they will surmount incredible dangers—and reap incredible rewards! 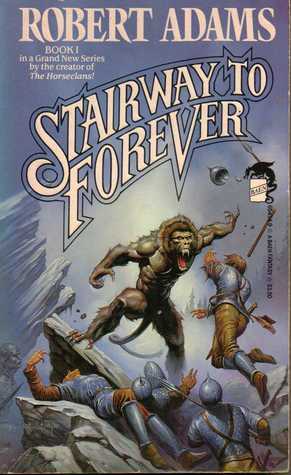 The first thing that leaped to my mind was Philip Jose Farmer's "World of Tiers" series. The first book, The Maker of Universes, does involve someone finding a portal to another world. However, since the portal is accessed by blowing on a horn, and I don't believe the protagonist had the ability to go back to our world immediately, this is probably not the book in question. The other world had a green sky - if that doesn't match, then this isn't it.